Welcome to WWC97 – Penny’s sketch challenge for this week! Once I decided to use this pattern from the Presents & Pinecones Designer Series Paper, I pulled my colours from it, and went to work. I stamped the snowman in Memento Black Ink onto Whisper White cardstock, then used my Stampin’ Write Markers in Cherry Cobbler, Emerald Envy Pumpkin Pie and Soft Sky to colour the snowman. I then used the new Stitched Shapes Framelits Dies – Circles to die cut the snowman, and one size up in Cherry Cobbler cardstock. I created a card base from Cherry Cobbler cardstock, then layered a panel of Whisper White on top of that. On the Whisper White, I stamped the sentiment from the Santa’s Sleigh stamp set in Cherry Cobbler ink. I then added the panel of Presents & Pinecones DSP, then added a strip of Emerald Envy cardstock. On top of that, the layered snowman was added. This card came together nice and easy; it would be a good one for making multiples! I hope you like it, too. Please head over to the Watercooler Wednesday blog page, take a look at the cards created by the rest of the design team – then link up your own card for the challenge! Thanks for spending some time with me today! If you don’t already have a demonstrator in Canada, and would like to purchase the supplies to make this card, just click on the images below, and you’ll be taken to my online store. And remember – there’s still time to shop the YearEnd Closeout sale! Previous Previous post: Ho, Ho – SNOW!? Wow, I love that little snowman from Jar of Cheer Deb. He’s so cute and just perfect for your take on the sketch challenge this week. 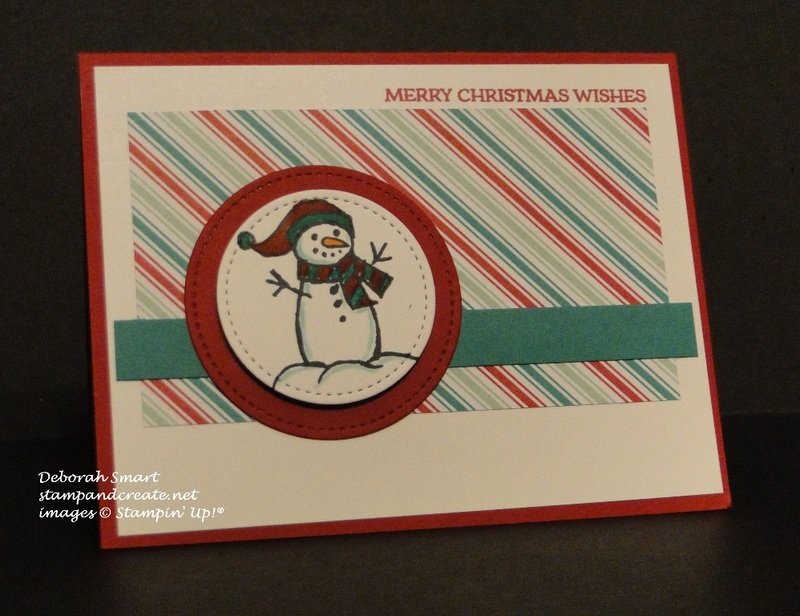 I love the striped paper background and those stitched circle dies that really layered up the snowman so beautifully. Thanks for sharing.